Astoria has to be careful about how much she indulges her vices. Awesome banner by red herring @ TDA! "Besides, when the Dark Lord wins, everyone will be celebrating," she had laughed, tilting her back onto Willoughby's shoulder. "What better time to get married? People will be calling it the wedding of the victors!" Seers were supposed to see the future, but this was not something she had ever seen coming. Ginny Weasley's first day at Hogwarts isn't quite what she was hoping for. Written for HPFT's New Beginnings Challenge. Lyall Lupin has no idea how he's going to educate his child. Then one night a world of possibilities open. This is the story how Harry found his true love. After talking to Hermione, Harry realises something about himself. Apollyon Pringle is the caretaker at Hogwarts. Unfortunately, he's been a bit liberal with his punishments of late. A year and something after her death, Severus writes Emmeline a letter. "How does kappa produce young ones?" asked Malfoy again. Albus flipped through the Potions textbook. Can Scorpius Malfoy save his father? Ron will be back to solve the case with Auror Harry Potter. It had sounded like a good idea at the time. After fighting for change at Hogwarts, Hermione has finally acheived something substantial. This is it, the beginning of the end of all that hatred... Hopefully? 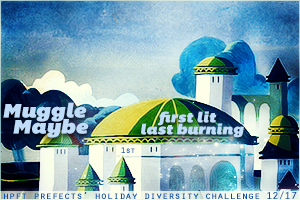 For the Holiday and Diversity Writing Challenge. Ginny always smelled of peppermint. days till Christmas break and Rose still hadn’t asked me to visit her family. Peppermint tea in a time of war.